It's no secret that I love spending time in the Great Outdoors. The girls and I head outside whatever the weather; I just make sure we are properly dressed for the elements, whether that means packing sun cream and sun hats, or rain coats and wellies. This time of the year is a particularly funny one, weather wise, in the UK. Sunny and warm one minute, with spring showers the next. I find I usually have to prepare for all eventualities when we head out and, unless we are in the middle of a heatwave, I always tend to carry waterproofs for us all, even if they are just left in the boot of the car. 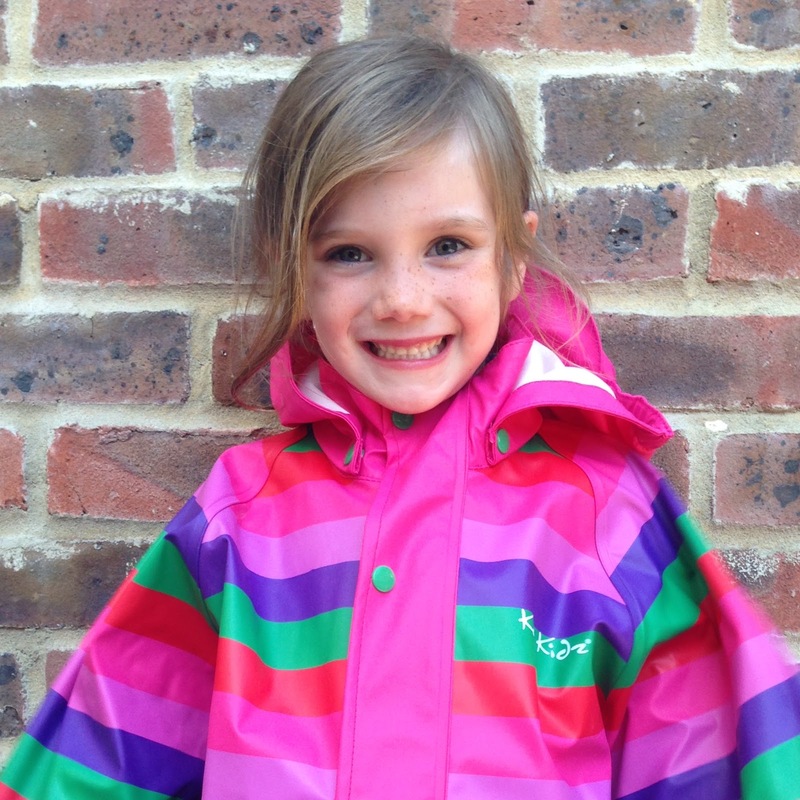 Daisy is now the proud owner of a gorgeous new pink stripe rain jacket from Kozi Kidz. The girls and I are all big fans of this Scandinavian kidswear brand - Evie had a set of their brilliant waterproof all in ones when she was little, and has now inherited Daisy's old rainbow stripe rain jacket which, I must comment, is still in an absolutely immaculate condition, despite being worn constantly over the past two and a half years! Proof of its durability for sure. 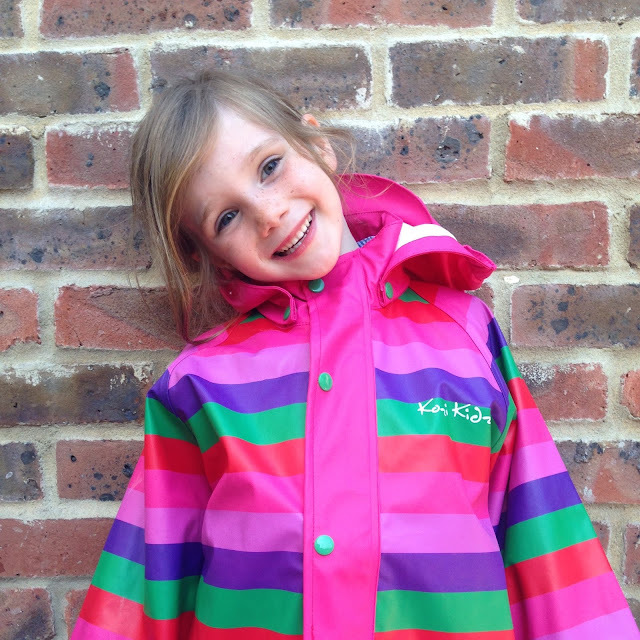 It's hardly surprising that the Kozi Kidz rainwear collection is award winning - it's 100% waterproof, made from phthalate free polyester with a polyurethane coating and has welded seams and a waterproof zip (with a zip garage at the top so littlies can't accidentally catch their chins when zipping themselves up). This particular jacket is lightweight (there is also a fleece lined option available) so perfect for this slightly warmer, unreliable weather and it has a detachable hood if you just want to use it as an extra layer in the dry weather. From a practical parents point of view, it has reflectors on it for increased visibility (with Daisy's rainbow jacket we found these particularly useful when walking home from school on gloomy Autumn afternoons) and is machine washable which is always a bonus! From a completely shallow, aesthetic point of view, there's no denying this is an eye catching design - Daisy and I both love it! At £37.80, I think this exceptionally well made rain coat is very reasonably priced - even more so now that I know how well they last, and that they make great hand me downs. The complete Kozi Kidz range is available online here and also at all good camping and hiking shops, like Cotswold Outdoor and Snow + Rock. DISCLAIMER: We were sent this rain jacket for the purpose of this post.